Simple, effective handwriting instruction for the elementary classroom. 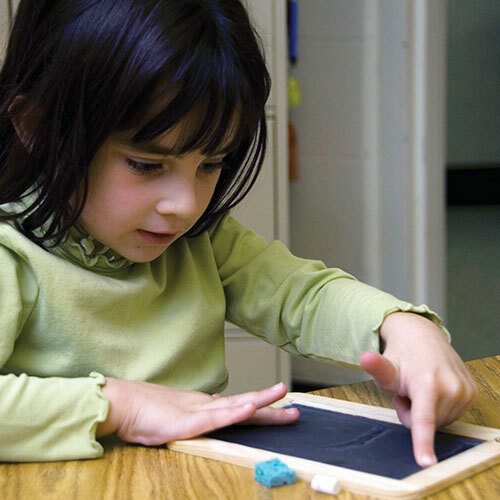 Multisensory activities and manipulatives appeal to all learning styles and provide a hands-on approach to handwriting. We help children develop their writing skills through explicit, multisensory, play-based instruction. Children move, touch, feel, and manipulate real objects as they learn habits and skills essential for writing. Research supports multisensory teaching to address children’s’ diverse learning styles: visual, tactile, auditory, and kinesthetic. Activities with hands-on instruction materials address different senses to teach correct formation, spacing, and sequencing. Each letter lesson begins with a multisensory introduction. 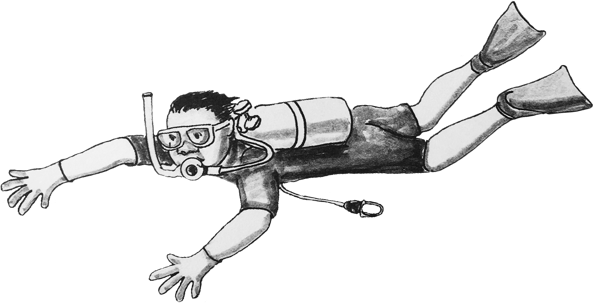 Fun activities are rotated to add variety and appeal. We use music to speak to children and promote movement and memory. Other multisensory lessons in the teachers’ guides use Voices, Letter Stories, Door Tracing, Air Writing, and Mystery Letter Game to teach letter formation and placement on lines. Teach handwriting alongside other subjects! Fun letter lessons and writing activities connect handwriting to math, social studies, ELA, and science. Rich content engages children and allows you to connect your learning from all subjects and practice handwriting. In addition to handwriting, we want the workbooks to have connections to other grade appropriate curricula. We created pages that help you teach handwriting and review other grade-appropriate skills and topics that connect to other lessons. For example, when children learn lowercase o, they learn that O is for owl. The can color the owl on the page while practicing lowercase o. The lesson then includes a social studies connection to go through an exercise where children compare nocturnal animals (like owls) with diurnal animals. These connections help reinforce learning and make handwriting relevant in all subjects. Innovative letter order and style are developmentally appropriate and promote easy learning for every letter, print and cursive. 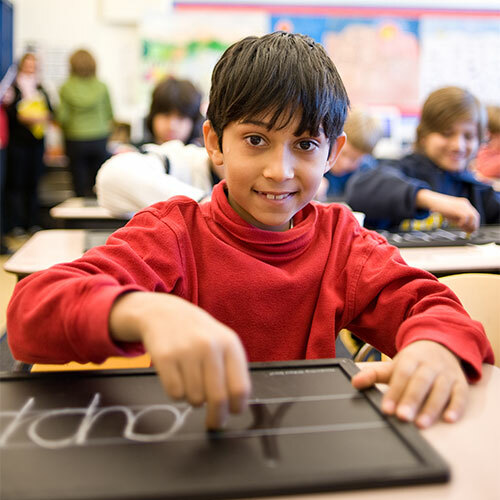 Our printing and cursive style helps children succeed in handwriting in an inclusive classroom. The continuous stroke looks like the letters and words children read every day. It’s developmental, prevents reversals, and prepares children for a smooth transition to cursive. Developmentally, capitals are easier, so we teach them first. The capital teaching order helps teach correct formation and orientation while eliminating reversals. Learning capitals first makes it easy to transition to lowercase letters. By teaching capitals first, we have prepared children for nearly half of the lowercase letters that are similar in formation. In cursive, we teach lowercase letters first to help children learn cursive skills in the easiest, most efficient way. It’s also developmentally planned to start with letters that are familiar from printing, making an easier transition from print to cursive. Once children have mastered lowercase letters, they transition to capitals. Find out more about our vertical cursive style in this video. 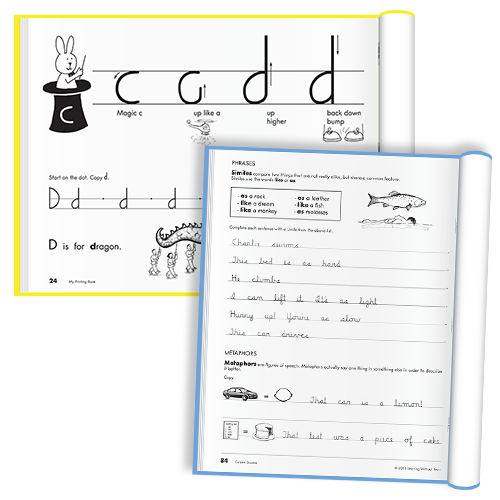 Clean, simple and intuitive approach to workbooks invites personalization and creativity and fosters handwriting success. Lefty-friendly with large step-by-step models. When teaching letter formation, we eliminate language that assumes that children understand left/right orientation, clockwise/counter-clockwise, or forward/backward circles. 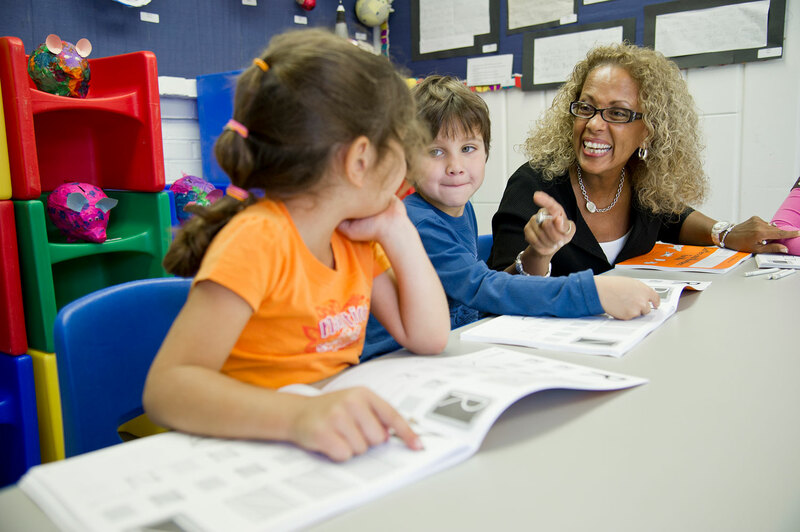 We make it easy by using fewer, carefully selected words that children know or understand. 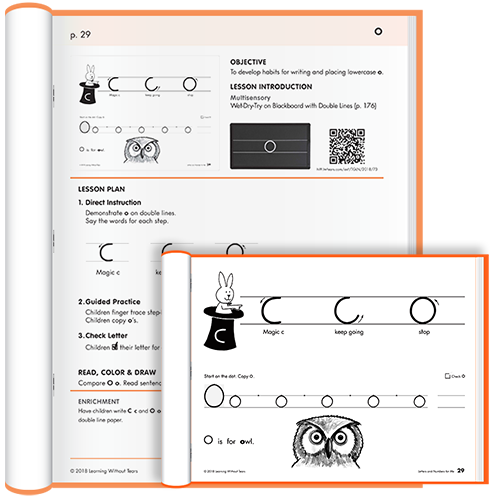 Our workbooks contain large step-by-step images that show students how to make each part of every letter. The black and white pages in our workbooks are clean and clear. Our simple workbook pages are appealing and invite children to color and draw once they have finished the lesson. The illustrations promote left-to-right directionality to encourage correct visual tracking and writing direction. Our workbooks provide activities for children to experience different types of lined paper. They begin with the simple double lines, then we teach them to master all lines. Our workbooks are lefty friendly. Teaching pages provide models on the left and right so that lefthanded children can easily see the model they are copying. Lefties never have to lift their hands or place them in an awkward position. Double lines and line generalization activities promote legible writing. When children know how to place letters, they can write well on any style of lined paper. To become successful and fluent writers, children need to prepare for all styles of paper. Our double lines quickly teach children how to place letters. Small letters fit in the middle space, tall letters go in the top space, descending letters go in the bottom space. Double lines help children place letters correctly, eliminating line confusion. The base line guides placement, and the mid line controls the size of letters. Students who struggle with start and placement on other styles of paper succeed on double lines. Many children have trouble understanding multiple lines. Giving children a blue line, a dotted line, a red line, and another blue line and then asking them to start at “2 o’clock between the dotted line and the red line” is too confusing. When children learn with double lines, they will have quick success with all lines they will encounter in the classroom. 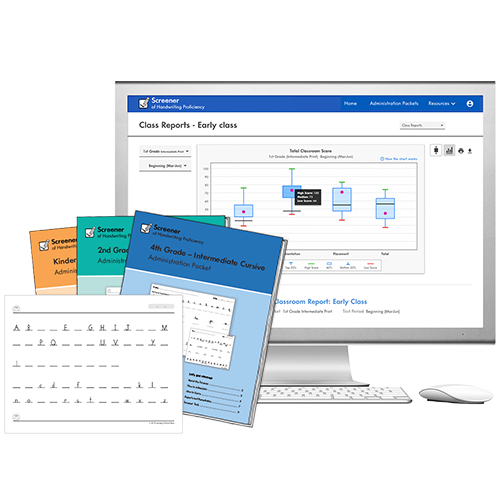 Easy-to-use assessments track handwriting progress in the classroom and support your instruction for year round handwriting success. Assessing handwriting is easy with the Screener of Handwriting Proficiency. Helpful for every teacher and student, the Screener is a free, easy-to-administer, whole-class assessment that helps educators and specialists assess critical and measurable skills that students need for success. Works with any handwriting curriculum to identify and measure specific skill areas where students need print or cursive instruction and intervention throughout the year. Includes both formative and summative assessments to identify critical gaps in literacy and handwriting skills (letter memory, reversals, and sentence structure). Helps educators better focus handwriting instruction. 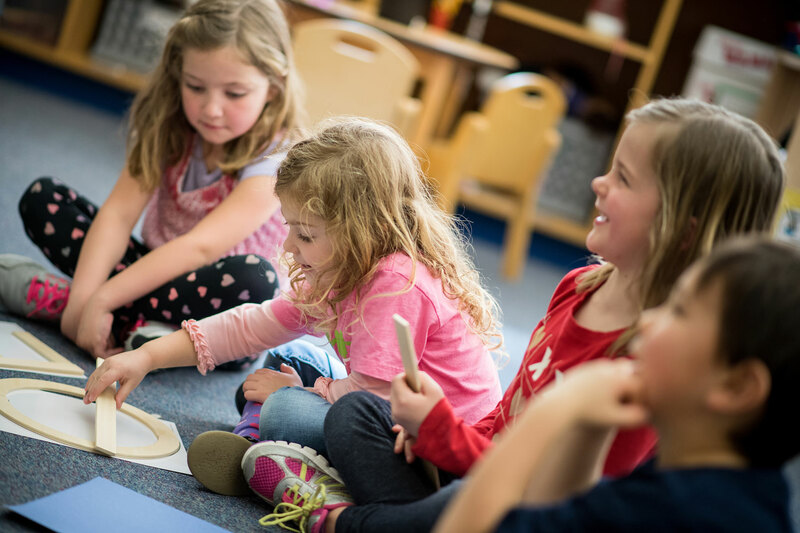 By playing, singing, and building letters, transitional kindergarten and kindergarten students develop the important skills they need to print words, sentences, and paragraphs. You will teach grip, letter and number recognition, and capital and number formation. Children learn to print using hands-on materials and developmentally appropriate activities. 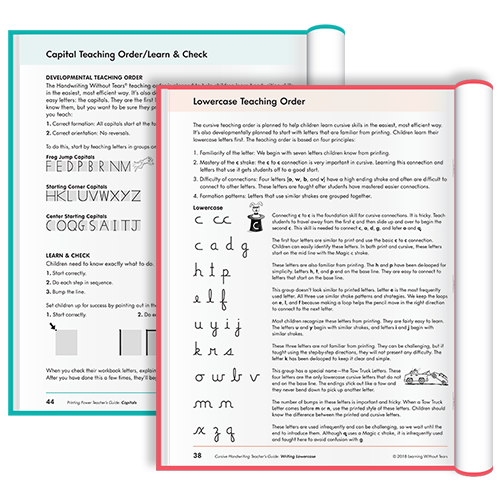 In grades 1–2, students progress to printing mastery with lessons that focus on functional writing practice. Our simple cursive style helps children transition easily from print. 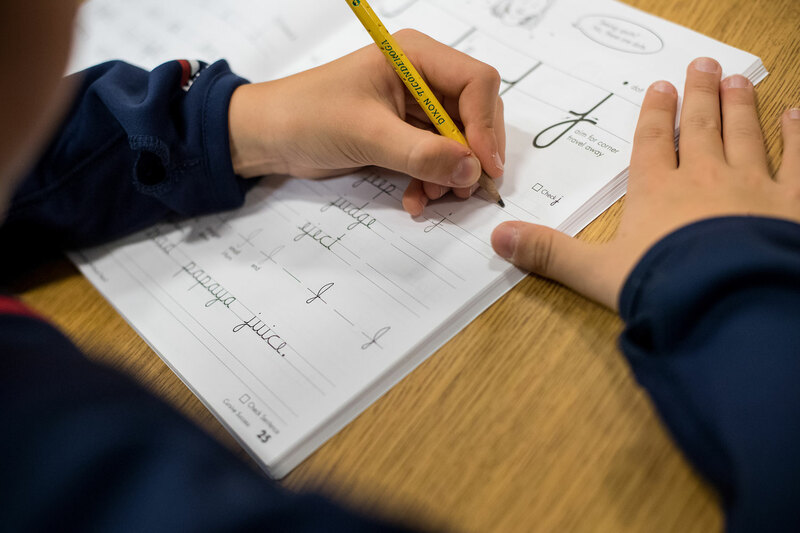 Using the same multisensory techniques, the cursive program begins in third grade when children have better developed hand-eye coordination.